What can I say. Everyone is a critic. Even my cat. A San Diego actor and blogger encourages people to continue the occupation from the comfort of your own home. Local artist artists asks Americans to send "occupied" dollars to their representatives. (San Diego, CA) San Diego actor and blogger Kevin Six was not a member of the Occupy movement but wanted to do something. When he heard that police were breaking up Occupy encampments he thought it was too late. Then he decided to do something. Six came up with a unique idea for anyone to make a protest statement from the comfort of his/her own home. 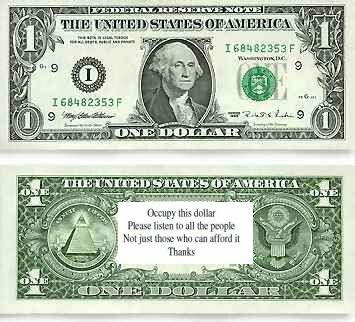 The "Occupy This Dollar" movement was born. 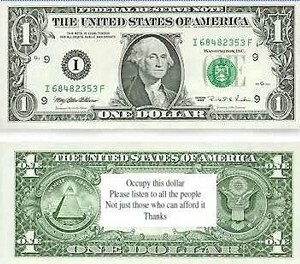 "'Occupy This Dollar' is a simple campaign," says Six. "All you do is go to the website, download the labels, stick them on your last 30 dollars and mail them to your representatives." Kevin Six believes is that, because politicians only care about money, the only way to get them to read a political statement is to stick it on a dollar bill and mail it to them. "I'm pretty sure they'll look at the good ole American Greenback," he said. He provides labels with the words "Occupy This Dollar, Please listen to all the people, not just those who can afford it, Thanks." People who want to Occupy something now can go to the website, download labels, stick them to US currency and mail them to their representatives. He also provides addresses for California residents and links for citizens of other states. "How great would it be if millions of people spoke out in this easy and inexpensive way," said Six. I live in San Diego, California so my list is of everyone from	the San Diego City Council up to the president. Download it here. One of the most interesting things about this whole child sexual abuse scandal is how it has unfolded on Sports Talk Radio. This is a testosterone-laden man fest all day on the radio and I listen on occasion because I am a Chargers fan. I heard more than one sportscaster speak frankly about his feelings this week. I have heard grown men come to terms with child sexual abuse in front of a radio audience and about 99% of them did so with intelligence and humility. I imagine it was not an easy topic for these men who never expected to talk, let alone share their feelings about it. But the very nature of the crime is so personal, so troublesome and has so many affected parties that it is impossible to take emotions out of the equation. And that's OK.
Feelings: We heard about this third hand. It didn't happen to us and we didn't witness it. But just hearing about it brings up so many emotions. Pity, anger, fear, anger, anger, anger. And each one of us witnesses and everyone involved has every right to feel any and all of those emotions. I think it's better that we talk about them as has been done on talk radio lately but everyone is different. But no one can tell us how to feel and when to feel it. This is our right. Responsibility: The word victim is going to be brought up a lot and I want to be clear that when I speak of victims, I am speaking about the children who were abused. Not the perpetrator who, it will come out in trial, was also a victim of abuse. Once he became an adult, his responsibilities changed. The child victims are the only ones who do not have the responsibility to report the crime. There are many reasons for this but basically it is because they are children in shock. Every other adult who was involved, however peripherally, in the Penn State Scandal failed. The adults who witnessed the abuse, heard the stories and those who held positions of responsibility failed and should be punished according to the laws and societal standards we have in place for such things. The old boy network that is Penn State Athletics protected itself and has been dismantled because of it. In its place is a wearier, wiser organization that understands their reporting responsibilities only too well. As do we. We have all thought about what we'd do. But just in case you were wondering, here it is. 1. If you hear about child abuse and child sexual abuse it is no longer good enough to report it to a superior. You must also take it upon yourself to inform the local authorities and follow up. You must do this regardless of how you are coerced to keep silent, to protect the network, to think of the families, to trust your superiors. 2. If you witness child abuse or child sexual abuse and you are an adult it is your right and responsibility to use any means necessary to stop it immediately. Ask Mike McQueary about that; he witnessed a man sexually abusing a child while a graduate assistant at Penn State. Sure he was young, probably shocked beyond belief and probably very low on the coaching totem pole. He told his superiors and trusted them but did nothing to protect the victim in the moment. He lives with the results of his inaction. And people want to kill him. 3. If you are a child to whom this has happened, you should be able to tell an adult about this and have your dignity retained. You should be able to be safe. You should also, and this might be the hardest part for the rest of us, be able not to pursue action. What would you do? We know this now. We have all thought what we'd do if we were in two of these situations and we all hope no one we love is ever in the third. But our job for that person is to love, support and respect him or her. Out reporting responsibility is clear. We must assume we are the only one reporting and following up on that report.